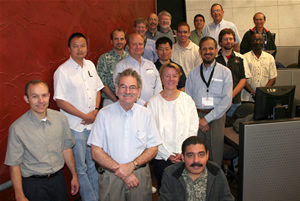 The Ralph Regula School of Computational Science at the Ohio Supercomputer Center is a statewide virtual school focused on the exciting new area of computational science -- the use of computer modeling and simulation to solve complex business, technical and academic research problems. Businesses recognize computational science as an essential tool for innovation and use it to develop new products. Researchers do the same to expand the frontiers of knowledge. Students may take part in the computational science minor or associate degree program offered at 14 colleges and universities throughout the state of Ohio. The program take an interdisciplinary approach to allow undergraduates to apply computational tools directly to their area of study. Students use these tool to solve real-world problems in a wide range of fields. In collaboration with the Ohio Board of Regents, OSC, and state colleges and universities, the Ralph Regula School ensures that Ohio students have the skillsets that companies need to support the use of this new approach to innovation.